Click Here for a downloadable PDF of this transcript. Click Here to watch a YouTube video of His Holiness Drikung Kyabgon Chetsang Rinpoche demonstrating the "nine round yogic breathing". The topic of discussion this evening is calm abiding meditation or shamata meditation. So Rinpoche says he’ll explain the method for engaging in shamatha meditation briefly, without getting too extensive. But to begin with, at the outset of engaging in shamatha meditation, it is really important to gather harmonious outer circumstantial conditions, meaning that one should have a situation for meditation that doesn’t provoke the afflictive emotions of attachment, aversion, or ignorance. If we don’t have a situation of favorable conditions to meditate in, then we’ll have many distractions that can disrupt our practice. If there are certain conditions that provoke the negative emotions of attachment, aversion, or ignorance, then we will have difficulty finding any progress in our meditation. So, to begin with, in order to have successful calm abiding or shamatha meditation, in the beginning we have to rely on outer circumstances that are favorable to the meditation. So part of this involves practicing the preliminaries that come before the preliminaries. So that means [we do] whatever we have to do before we sit down on the cushion, whatever preliminary activities we may have to do – if we have to close the door, or open a window, arrange offerings, or change into comfortable clothes. Whatever preparations we need to make for our meditation practice should be done before we actually sit down on the cushion and begin our meditation, so our meditation is not disrupted once we have already sat down. So these are the preliminaries that precede the preliminaries – the preliminaries concerning the preparation for our meditation practice before we sit down to meditate. Then once one has done whatever outer preliminaries that need to be established before the meditation, when one actually sits down to engage in the meditation, there are the preliminaries of sitting in the appropriate posture, expelling the stale breath, and so forth. So sitting in the correct posture means sitting in the seven-point posture of Vairochana—one’s spine should be completely straight, and one’s feet should be crossed in the lotus position. If one can’t sit in the lotus position, then that’s okay, just whatever [is] comfortable - half-lotus, or a comfortable position like the one we are sitting in now. And then one’s body should be relaxed, not too tight. One’s hands can be either resting on one’s knees or placed in the gesture of meditative equipoise with one hand resting on top of the other. Rinpoche says most of you are probably familiar with the seven-point posture of Vairochana, so particularly the most important is that the back is totally straight, the chin is tilted slightly down, the tongue is resting on the palate of one’s mouth, the navel is gently tucked slightly in and up, and the eyes are gazing down towards the tip of one’s nose. The benefit of sitting in the seven point posture of Vairochana, is that if the abode of the body is straight, then the channels are straight without any sort of blockages. Then if the channels are straight, then the winds move freely throughout the channels. If the winds are not obstructed or contorted in any way, then the mind has the ability to settle more easily. The mind can establish proper meditation of calm one-pointed focus, without the faults of torpor or sleepiness or agitation. This seven-point posture of Vairochana can really help to achieve the proper abiding of the mind. Also, the seven-point posture of Vairochana helps to purify the obscurations accumulated through the door of the body, or the physical obscurations. So when we have the preliminary of the abode of the body/posture established, the seven point posture of Vairochana, then there is the preliminary of expelling the stale breath. So this generally is done extensively. One first breathes through the left nostril three times and then breathes out three times, and then through the right nostril, breathing in three times and out three times, and then through both, breathing in three times and out three times, which is nine in total. But if one only does the abbreviated version, then you can breathe in and out once through your left nostril, in and out once through your right nostril, and in and out once through both nostrils. The method for breathing is that first one breathes in slowly, gently, and deeply, and the breath should be at the beginning of the inhale, gentle and slow, so that the first inhale is sort of gentle, slow, and deep. Then, with the exhalation, first you breathe out gently, and in the middle of the exhalation, it is a little bit stronger and more forceful, and then towards the tail of the exhalation, again it becomes gentle and more subtle. This is how all your exhalations should be. And then the visualization that goes with the exercise, is that as we breathe out, we can visualize that our breath that we are breathing out is sort of smoky and dark in color – like black smoke. This signifies all the negativities and obscurations that we have accumulated throughout beginningless samsara, throughout many lives since beginningless time in cyclic existence. And so you are visualizing that all of that negativity and non-virtue, defilements and so forth are exiting through that exhalation, that you are expelling all those obscurations and defilements. Then when you breathe in, you can visualize that you are breathing in completely clean, pure air that is luminous in nature. So it is like clearing away all the lack of clarity in the mind. It is like a brightening and purifying of the mind, and clearing out any sort of heaviness, sleepiness, and agitation. When we can engage in the exercise of expelling the stale breath with real presence of mind, then it can be quite powerful. It can purify the obscurations of our speech and the obscurations of the mind. So when we meditate, or the process of meditation, is a means to progress in the direction of virtue, or it is a virtuous activity in and of itself. It is a method of turning the body, speech, and mind towards virtue. When it comes to practicing virtue of the body, speech, and mind, the most important is the mind. So the degree of our virtuous intention in our mind determines the degree of the virtuous intention overall - the virtuous intention of body, speech, and mind. So when it comes to recognizing what is a virtuous intention, the qualities such as renunciation, love, compassion, the wish to benefit others – these are all virtuous intentions. So at the outset of our meditation, it is really important that we generate a motivation that is based on these positive qualities so that our meditation is really of a virtuous nature. Particularly, if we can generate the vast mind of virtue, by generating bodhichitta, if we generate bodhichitta, this bodhichitta is the vast mind that embraces the welfare of all sentient beings. So one’s intention is to engage in dharma practice and virtue, not just for one’s own benefit, but for the benefit of all sentient beings, without exception. So first, if we give rise to compassion, thinking about the suffering of limitless sentient beings, with an authentic mind of concern, to the point that you feel that you just can’t bear to see others suffering. Based on this mind of compassion, then if we wish to bring all sentient beings who are suffering out of their experience of suffering and place them in states of happiness, so with the wish to place all beings in temporary and ultimate happiness, we set about engaging in virtue with that objective in mind. If we have a really vast intention like this, this is bodhichitta. Bodhichitta is the compassion that has the objective of sentient beings, united with wisdom, which has the objective of attaining complete enlightenment. The union of these two is the mind of bodhichitta. The third of the preliminaries for the meditation is establishing the mind of devotion. The mind of devotion is like the door to meditative absorption. So at the outset of our meditation, after we have established the correct posture, and engaged in the exercise of expelling the stale breath, then we meditate on our root lama in the form of the deity at the crown of our head. So according to different lineages there are different traditions. First of all, developing a mind of faith and devotion towards one’s spiritual teacher, towards one’s root guru, who is the one from whom one receives the teachings, transmissions, and empowerments, then if one belongs to the Kagyu tradition, one can meditate on the form of Vajradhara at one’s crown, who is in essence the same as one’s root guru, or spiritual teacher. Then in the Nyingma tradition, the Nyingthig tradition, if one’s spiritual teacher is a fully ordained monk, then one can meditate on the spiritual teacher in the form of Shakyamuni Buddha, and if one’s teacher is a ngakpa, then one can meditate on him in the form of Guru Rinpoche. 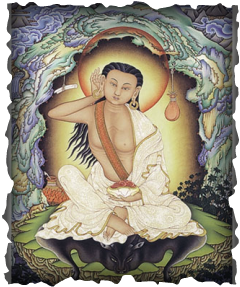 Whether it is Vajradhara, or Shakyamuni, or Guru Rinpoche, or if one has a yidam deity that one practices, then one can meditate on the guru in the form of the yidam deity, whether it is Chenrezig or whatever yidam deity that one generally practices. Then one can meditate on one’s yidam deity at the crown of one’s head. Whatever enlightened form that one chooses to meditate on, then the deity is inseparable from the mind of one’s root guru. So Guru Rinpoche, or Vajradhara, or whichever form one chooses, is sitting at the crown of one’s head, upon a lotus and on top of the lotus is a moon disc. This lotus and moon disc seat is placed on top of a jeweled throne, that is held up by snow lions. On top of this throne is the lotus and on top of the lotus is the moon disc seat, and then seated on top of the lotus and moon disc seat, is one’s root guru in the form of Vajradhara, or Guru Rinpoche, or Shakyamuni Buddha, and so forth. So when one meditates in this way, on one’s guru at the crown of one’s head, one should do so with the five pure perceptions. So one should visualize or feel, generate the perception of one’s spiritual teacher as the Buddha in person. There are the explanations for doing this based on scripture and based on reasoning. So one generates the perception of one’s teacher as being the Buddha in person. So as far as the basis of scripture is concerned, since the Buddha himself said that he would emanate in the form of spiritual teachers for the benefit of beings, in an ordinary form, as an ordinary individual, in the role of a spiritual teacher to guide beings along the path and lead them to the final goal of liberation and complete enlightenment. So then with respect to reasoning, one can think about it, developing the understanding of the benefits of generating the perception of one’s spiritual teacher as the Buddha in person. For instance, there is regarding the qualities of the spiritual’s teacher’s body, speech, and mind as the enlightened body, speech, and mind of the Buddha, or the embodiment of the three jewels. So the spiritual teacher’s body is the Sangha, his speech is the dharma, and his mind is the Buddha. Then there are the teachings on the kindness of the spiritual teacher that in some ways he is even kinder than the Buddha, because the spiritual teacher is present to guide you along the path, so in that way, he is said to be even kinder than the Buddha. So the kindness of the spiritual teacher is said to be even greater than the Buddha because in the past we have taken many births in cyclic existence, and there have been many Buddhas that have appeared, but still we have not been led out of samsara, we have still not attained liberation and enlightenment. So now, due to the kindness of spiritual teachers, we can meet and receive the teachings on the sublime dharma, the path is indicated to us, and so we have the pith instructions and the methods for achieving liberation and enlightenment. So the spiritual teacher is said to be the emanation of all past Buddhas, he is the representation of all present Buddhas, and the symbol of all future Buddhas. So in that way, he is the embodiment of all of the Buddhas of the three times. Establishing the visualization of the deity at the crown of one’s head, who is inseparable in nature from one’s own root guru, then with a mind of faith and devotion, one should supplicate in order to receive the blessings of the meditative absorption of the guru’s mind. So the yidam deity, or the deity, inseparable from one’s guru, melts into light, and that light then dissolves into you, entering at the crown of your head in the form of radiant light. That light pervades your entire body so that your mind and the mind of the guru become inseparable. When your mind merges with the mind of the guru, then without following after thoughts of the future, and without becoming involved with or dwelling on thoughts concerning the past, and without getting entangled in thoughts that concern the present moment, one should rest in a state of complete alertness, or present alertness and stillness of mind. So generally our mind is vulnerable to the constant arising of the afflictive emotions, and it is difficult for the mind to rest in one-pointed concentration, or to calmly abide in stillness, because of the karmic imprints of these afflictive emotions. Because the karmic imprints of obscuration are very strong, they are very thick, it is difficult to abide without the mind becoming distracted, without following after the conceptual delusions of the mind and so forth. It is really difficult to do this because of the thick karmic imprints that exist in the mindstream. So when we practice calm abiding, then we strengthen the mind’s ability to abide single-pointedly in a peaceful stillness. So there are two types of shamatha meditation, or two types of calm-abiding meditation. There is that that relies on a support and that that is without a support. So the type of calm-abiding meditation that relies on a support is, for instance, taking an object and placing this in front of one, in one’s field of vision, directly in front of one, like a small object, like a small white stone. Then you rest your eyes, your gaze, should be rested, loosely and gently on that object of meditation – on this white stone that is placed in front of you. Then when the gaze is resting gently on the object in front, then the mind also is resting together with your gaze. So without becoming distracted by the thought forms of the mind, then you rest your mind together with the support of your gaze on that object. One can choose to use as one’s object of meditation a representation of the Buddha’s enlightened form, like a small statue or an image of a deity. One can place this in front and in the same way as with the white stone, you can rest your gaze on the form of the deity and allow your mind to abide with single-pointed focus on the form that is placed before you. Another method is to gently rest your gaze at the tip of your nose without allowing the eyes to move around and look at different things. This is the purpose of an object of focus. Generally, if our eyes are moving about and looking at different things, then it is particularly difficult for the mind to stay still. So when we give ourselves an object of focus to gently rest the gaze upon, then the mind just naturally settles in a state of stillness together with the gaze. And so again one can focus one’s gaze at the tip of the nose. Whatever one chooses as an object of focus, one should rest one’s mind gently on this object of focus without becoming wrapped up in the thought forms that arise in the mind. Another method, particularly if one has a difficult time establishing stillness with the mind or stability in one’s meditation, if it is difficult to abide with single-pointed focus, which it generally is in the beginning, then one can alternate one’s object of focus. So, for instance, we also have analytical meditation and we can use analytical meditation as our object of focus. Generally, if we start to get wrapped up in thoughts, and if they are thoughts that are based on attachment, aversion, or ignorance, then the mind has gone in the direction of non-virtue. So in order to pull the mind back and direct it in the direction of virtue again, then one can use analytical meditation based on the teachings. So, for instance, generally we choose our object of analytical meditation according to whatever progressive stage in the path. So, beginning with the Four Thoughts That Turn the Mind, for instance, if you have heard teachings on the difficulty of obtaining a human birth complete with the leisures and endowments, then as an object of meditation, you can contemplate the difficulty of obtaining a human birth complete with the leisures and endowments based on teachings you have heard or based on texts you have read. Contemplate it, think about what it is that you have heard, why it is that it is so difficult to obtain a human birth with the leisures and endowments, and so forth. Think about it in a way so that you can identify with it to the point where you really establish a feeling of certainty, a feeling of conviction, when you feel like ―that’s really true, it’s so incredible that we have this opportunity in which we have a precious human birth with the leisures and endowments and this is really a situation that I shouldn’t let go to waste.― Ishould really use this precious opportunity to engage in virtue. When you have this feeling of certainty, and then maybe when the mind becomes tired from the analytical contemplation, then when you don’t want to think about anything, once you have tired yourself out through the process of analysis, then let go of the analytical meditation and let the mind relax in stillness without any object of focus, without focusing on any object in particular. Just allow the mind to rest in stillness without becoming wrapped up in any kind of conceptual processes or thoughts. In this way, you can alternate between the analytical meditation and the resting meditation. So first you can meditate on the difficulty of encountering a human birth complete with the leisures and endowments, and once you become pretty clear about that, you can move on to impermanence, the faults of cyclic existence, karma cause and effect, and so forth. With the analytical meditation, you use your mind to establish certainty with respect to the instructions, with respect to the words of the teachings. Then when the intellectual understanding is clear, one develops a real sense of identifying with the truth of these teachings to the point where you feel a real sadness at the suffering of samsara and give rise to an authentic sense of renunciation. When you give rise to an authentic sense of renunciation, then the wish for liberation arises, and you have a really strong, authentic desire to seek liberation and enlightenment with a genuine understanding of the essencelessness of samsara, cyclic existence. In this way, developing the analytical meditation increases and strengthens the faculty of wisdom. Then when we become tired with the analytical meditation, we can let the mind rest in meditative absorption without any particular focus, just establish the still abiding of the mind. Then you can alternate back and forth between these two. This is a good method because it strengthens the aspect of wisdom and it also strengthens the aspect of abiding in stillness, or one-pointed concentration. So abiding in one-pointed concentration is shamatha, or calm-abiding meditation. When we have the aspect of wisdom in our meditation, this is Vipassana, or special insight, so this kind of alternating strengthens both the aspects of calm-abiding and special insight. So with the analytical meditation, one can begin going through each of the Four Thoughts That Turn the Mind. Then when you feel you have really developed a genuine sense of renunciation, and the wish to seek liberation and enlightenment, then we can start developing the analytical meditation on love and compassion and so forth. You can develop the Four Immeasurables, using the same sort of conceptual meditation. So first meditate on immeasurable love, then meditate on immeasurable compassion, immeasurable joy, immeasurable equanimity. Then, once one has developed the Four Immeasurables, then you can work on equalizing self and other, exchanging self and other, and regarding only the benefit of others without any thought of oneself. Then one moves on from that and develops the six paramitas. So in this way, we can develop these stages of meditation according to the stages of the path. If you develop this meditation with alternating between analysis and abiding, then eventually it will become easy to rest the mind wherever you wish to rest it, so you will gain a flexibility of the mind or an ability to control where it is you wish to place your mind. So it will become easier to meditate. The more that you exercise these practices, the more that you train in them, then naturally the easier they become as you become more habituated to them and eventually it will be really effortless; it will be natural and effortless. The benefits for establishing or developing meditative absorption are very great and very vast. The reason for this is because generally when we think about what it is that our mind is pre-occupied with or where it is that we generally place our mind, our mind is generally wrapped up in discursive thoughts that are based on afflictive emotions, the afflictive emotions of attachment, aversion, and ignorance. Generally, the delusions of the mind are really only of a non-virtuous nature. They are generally only concerned with non-virtue. Usually, we are distracted by beautiful, pleasant forms. If we see forms that we behold with our eyes, we have attachment to those that seem appealing. We consider them to be good and we wish to possess them or own them, or gain them, and this is desire. Otherwise, we encounter things that we have aversion to, that we consider negative and then we develop aversion, or hatred, or anger towards them, and this is non-virtue. Or we are generally pre-occupied with neutral thoughts that are based on ―oh, I need to do this, and I need to do that, and I shouldn’t forget to do that‖ and all of these sort of meaningless activities and so forth. One is concerned with meaningless thoughts and that falls into the category of ignorance. There are all these thoughts that are endlessly arising in the mind that we completely identify with, attach to and consider to be somehow substantial and important. We attach to these thoughts and identify with them without recognizing that they are fueled by the negative emotions or afflictive emotions. So whenever our thoughts are preoccupied with any of these negative emotions then we are engaged in non-virtue. These thoughts of non-virtue only perpetuate the root of suffering. They only continue to fuel samsara. When we change our focus from one of non-virtue to virtue, when we transform our habit of thinking, transform our habit of generally being pre-occupied with thoughts of non-virtue, and fueling and perpetuating thoughts that are based on non-virtue. When we instead train ourselves to perpetuate the thoughts that are based on virtue, thoughts of love and compassion, bodhichitta, the wish to benefit others, renunciation and so forth, faith and devotion, this is the actual process of purifying the mind. Our mind can only be concentrated on one thing at a time. Even if our thoughts occur in seemingly small moments, at one moment, the mind can only be focused on one thing. So if it is virtue that is in the mind, then there cannot be non-virtue. Likewise, if there is non-virtue in the mind, there cannot be virtue, because the mind can only think about one thing at a time. When we develop a virtuous abiding of the mind through the process of analytical meditation, for instance, if we are using love or compassion as our topic of focus, by first thinking about and contemplating love and compassion, then there is the feeling that arises, then once we have developed a feeling of love and compassion, then we can drop the contemplation aspect of the meditation, and just rest in that feeling with one-pointed focus, without thinking about anything at all, just abiding in stillness with that feeling that has arisen from the contemplation on love or the contemplation on compassion and so forth. Then, say, if we are focusing on love, and there is the feeling of love we have developed from that contemplation, then when we drop the contemplation and are resting in stillness with the feeling that has arisen from the contemplation of love, then this is called the meditative absorption on love, or the emotion of compassion, and so forth. This is a method for developing the different samadhis of the Four Immeasurables, by first contemplating and then resting in the emotion that has developed from the contemplation. In the beginning, it is important to have many short sessions, to have meditation sessions that are not too long, that are fairly short, but to have many of them in number and frequently. The reason why it is best in the beginning not to have sessions that are too long, is because if we limit ourselves to short sessions in the beginning, then it will ensure the quality of our meditation. If we give ourselves too much time in the beginning, before our meditation is really developed, then we may fall into a state of fogginess, or meditation that lacks clarity, or we may just start thinking, following the stream of thoughts that arise in the mind by getting entangled with them and then we will no longer really have a very effective meditation. In fact we won’t really be meditating any longer. So it is best, in the beginning, not to have sessions that are too long, instead, we should establish meditation sessions that are shorter in duration. And we should have many sessions, so that eventually we will build up our ability to sustain the quality of our meditation. Then, eventually, as we progress, we will be able to have longer and longer periods of meditation and eventually, we will be able to meditate correctly for as long a period of time as we wish. When you develop your meditation over time, the more that you become accustomed to the meditation, and the deeper that you are able to abide in calm abiding, or single-pointed concentration, then there will begin to arise the experiences of bliss, clarity and non-thought. This comes after a certain level of development, once one has established a certain level of habituation. Then at that point, the meditation becomes extremely enjoyable and extremely pleasurable and there is no feeling of it being a chore at all, at that point one really delights in the activity of meditation. There is no greater happiness or fulfillment that can come from anything else. But these are still just experiences. The experiences of bliss, clarity, and insight are experiences that come from concentration. Then the further that one’s meditation is developed through these experiences, then when the illusion of the experience is shaken off, or once one passes beyond the experiences, then one realizes that there is no need to have attachment to these temporary experiences of bliss, clarity, and non-thought, and one attains a certain level of freedom from attachment to these experiences, one experiences a more profound level of insight in which one realizes emptiness. So the true nature of the mind or the true nature of emptiness is realized but there is still a subtle attachment to that realization of emptiness and the sort of revelation of ―this is emptiness‖. Even as one’s meditation develops through this then eventually this attachment is shaken off or transcended and then one realizes the truenature of the mind without any fault of fixation or without any of the veils of experience and so forth like the experiences of bliss, clarity, and non-thought. So when the true nature of the mind is realized without this subtle fixation to emptiness and without attachment to the temporary experiences that come from meditative concentration, this is authentic realization. So first there is the Samadhi that is based on single-pointed concentration in which the temporary experiences of bliss, clarity, and non-thought arise. Then as the meditation deepens further, there is the Samadhi with the subtle clinging to the conception of emptiness, and then once that is transcended there is the Samadhi that is called the Samadhi of the Sugatas. In this Samadhi, then the true nature is realized without any misconceptions, it is realized in its complete authentic actual reality. Q: When it is very quiet and there is no thought, I am worried that I am just asleep. No time passes and then more alertness comes back, I think during that time I was just asleep. Is there a way to make sure? A: There are methods to clear away the torpor or fogginess, mental fogginess. First of all, making sure that your posture is really straight. Also, sometimes if it is too warm, or too hot, this can increase mental fogginess or sleepiness, so you can try to make it cooler or meditate in a place that is a little bit cold. You can also look up at the sky, and make sure your field of vision is directed towards something that is open and spacious, so that whatever you see is sort of bright and spacious, wherever you are seated it is like a spacious, open space in front, looking up at the sky or mountains or something. Then this can add clarity to your meditation. If you get sleepy, you can also sort of move your waist around, move your hips and waist in sort of a circular motion. Move your body around a little bit as you are sitting in the meditation posture. This can help to refresh you. But if you become really sleepy and foggy, then it is maybe not of any benefit to sit there and continue to meditate. It may actually be better to get up and go outside and walk around, exercise your body a little bit. Then after you have refreshed yourself like this, then you can sit down and meditate again. So in general, specifically before you go to sleep, if you direct your mind towards virtue, if you fall asleep thinking virtuous thoughts, then your sleep can become virtuous, based on the virtue that was in your mind at the outset of sleep. Your sleep can go onto the path of clear light luminosity, your sleep can become virtuous. But if you are pre-occupied with thoughts of anger, ignorance, or desire, as you fall asleep, then your sleep becomes non-virtuous, then it goes onto the path of non-virtue.